This week, two universities stage performances that deal with two differing aspects of the human condition, while a local ensemble continues its tenth season and metro libraries welcome a unique flavor of Canadian music. 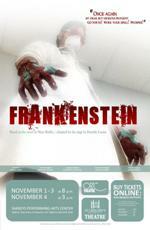 If you’re still in the Halloween spirit, St. Gregory's University Theatre can satisfy your macabre side with its production of “Frankenstein” with performances from November 1st through the 4th. This stage adaptation of Mary Shelley’s classic work of resurrection and human compassion was written by playwright Dorothy Louise based out of New York. Frankenstein and his monster take the stage in Shawnee at 8:00 p.m. from Thursday through Saturday and at 3:00 p.m. for a Sunday matinee. Shawn Churchman directs the University of Oklahoma Theatre department for its next production of the fall season. “Avenue Q” is a musical by Robert Lopez and Jeff Marx about the disenchantment of becoming an adult. It features puppets alongside actors, making it reminiscent of Sesame Street. Opening night in the Rupel Jones Theatre of the Fine Arts Center in Norman is November 2nd. Performances run through November 11th, and “Avenue Q” is recommended for mature audiences. Brightmusic, a five piece chamber ensemble based in Oklahoma City, continues its 10th anniversary season with its next program “Bright Strings.” On Sunday, November 4th Brightmusic performs at First Christian Church in Norman, then moves to All Souls’ Episcopal Church and St. Paul’s Episcopal Cathedral in Oklahoma City for shows on the 5th and 6th. Each performance features three pieces by Ludwig van Beethoven, 20th century French composer Reynaldo Hahn, and Johannes Brahms. All next week, Metropolitan Library System libraries welcome a bit of Canadian culture with performances by Québécois band Genticorum. The trio incorporates flute, fiddle, electric bass, and even sounds from tapping feet into their music. They perform at libraries in Oklahoma City, Edmond, Midwest City, Bethany, Choctaw, and Del City from November 4th through the 9th. The band formed in 2000 and since then has released 4 albums and traveled to perform in 15 countries. Science Museum Oklahoma celebrates Chemistry Day 2012 with activities on November 2nd from 9:00 a.m. to 4:00 p.m. A few of the hands on demonstrations and experiments include Guess the Gas, Reaction Rockets, Cold Chemistry, and Playing with Polymers. In response to Hurricane Sandy, The American Red Cross holds several blood drives throughout the metro area from November 1st through the 12th. Click here for a listing of the blood drives closes to you. Adults ages 17 and older in good health and weighing at least 110 pounds are considered for donations. Visit our calendar page for more events this weekend.